At a Mott Haven church, a big room with beige carpet, dark-red curtains and light walls hosted 35 kids for their weekly orchestra rehearsal. After an hourlong bilingual music lesson and repeated rounds of section practice, the orchestra harmonized in rhythm and their melody soared. 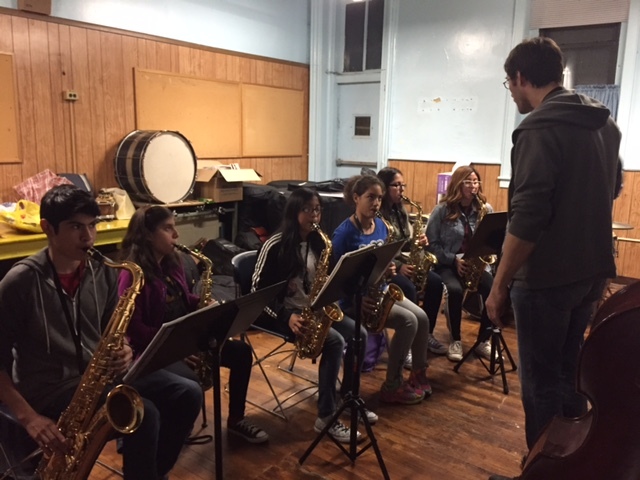 The lessons were being offered by UpBeat NYC, a Mott Haven non-profit that brings music to young people who get no music training in local public schools. Austria and her husband, Richard Miller, both of whom have backgrounds in music education, established the program in Mott Haven and Bedford Stuyvesant in 2009 as a response to cuts in arts programs in public schools.. They later narrowed their focus to Mott Haven so they could address the acute local need for it. Full-time and and part-time certified teachers in South Bronx schools have been among the hardest hit by education cuts, according to a 2014 New York City comptroller’s report. Inspired by a program in Venezuela, Austria and Miller founded the program with the belief that music has the power to create social transformation. Hunter College music professor Victor V. Bobetsky agrees. In an email, he wrote that music encourages individual expression and creativity and reinforces the benefits of working together to achieve a common goal. “It is especially critical that at-risk children have opportunities to develop their talents because they especially need arenas in which they can excel,” he added. Parents say that although they have involved their children in many different after-school programs in the neighborhood, UpBeat NYC has improved the communication skills of their children the most and has made them more ambitious. Chantiq Vasquez, mother of Adriyana Gonzalez, 10, said that her shy daughter now speaks out more and gets along better with older kids. Parent Laura Campos said her 10-year-old daughter Ashley Rocha, who started the program three years ago, has told her she wants to be a violin teacher. Despite some participants struggle to remain in the program due to a lack of parental support, many succeed through their own determination, said Austria, adding that the organization tries to keep families engaged with regular phone calls and home visits. In addition, it is planning more outdoor events as a way to attract more young people. In July, the group made a trip to Venezuela and performed as part of a cultural exchange program, representing the South Bronx internationally and connecting the youth of Caracas with the youth of the Bronx. In September, UpBeat NYC brought the National Youth Orchestra of Caracas – a 160-member ensemble whose players are between 16 and 24 years old – to perform in Crotona Park. The event was sponsored by CITGO’s Simón Bolívar Foundation, which has been supporting non-profit organizations committed to social development in the South Bronx. This year, UpBeat NYC will serve 150 children and youth. The only requirement to be accepted into the program is that families reside in the South Bronx – no auditions are held. All participants rehearse and play in groups as soon as they enter the program. The rehearsal sites are Tercera Iglesia Bautista, the Mott Haven Public Library and St. Jerome School. Individual NYC residents donate most of the instruments, said Austria. Among the 18 teachers, some are volunteers and others are paid. Other donors include the New York State Council on the Arts, NYC Department of Cultural Affairs, CITGO/Simón Bolívar Foundation and private contributors. Last year the organization had a budget of $115,000.